Just like passenger transport, the freight transport sector is in the middle of a complete transition. Challenges and drivers to change are high, as concerns about climate change, air quality and congestion are becoming at the top of the political and societal agenda, while the sector on its own is expected to further increase significantly over the next years. How to reconcile these trends? At the COP21 in Paris in 2015, the European Union’s (EU) objective was to reduce the greenhouse gas (GHG) emissions by 40% below 1990 levels by 2030, and transportation must play a vital role in achieving this target. At this moment the transport sector is responsible for 32% of the CO2 emissions in the European Union (EEA, 2017). Can we find solutions in innovative concepts or technologies for the logistics sector? How do we see this sector evolve in the future? During a 2 day workshop organized by the NECTAR 3 cluster, the future of freight transport was discussed. NECTAR is a European-based scientific association with as a primary aim to foster research collaboration and exchange of information between experts in the field of transport, communication and mobility from all European countries and the rest of the world. Cluster 3 is a subgroup of researchers working on logistics and freight transport. In March 2018 this cluster 3 meeting was organized at the premises of IUAV University in Venice, we looked at how freight transport would look like in the future. This Topical Collection comprises six papers discussed. Two papers in this Topical Collection were oriented towards the last mile and e-commerce, which is the fastest growing segment and which a clear challenge for all stakeholders. Katrien Ramaekers et al. worked out a vehicle routing model to study the impact of delivery time windows in e-commerce. If customers would be allowed to choose the preferred delivery time window, this would considerably influence the costs. Valerio Gatta et al. looked at the possibilities of crowd shipping for the last mile. They imagined an environmentally friendly variant of crowd shipping with locker systems connected to the mass transit system. A stated preference survey was performed to understand the potential of such a new system. Model results show that Automated Parcel. Lockers location is the most relevant feature in the process. Additionally, the paper analyses the demand side by investigating how potential e-commerce users can be stimulated in choosing a crowdshipping service for delivering the goods they bought. Results show that the possibility to plan the delivery date and its time schedule has the highest impact on consumers’ utility. Four papers in this Topical Collection examine modal shifts in freight transport. Indeed, if we want to attain the decarbonization goals of the European commission a considerable shift towards more environmentally friendly modes will be necessary. Silvio Nocera et al. looked at the possibilities of intermodal rail transport, and more specifically on how to reduce the external costs along the Brenner corridor with its intermodal options. They found out that if the goal of a modal split of 29% road- 71% rail is achieved in 2035 the external costs would decrease by 26%. The next step in intermodal transport, is synchromodal transport, in which in a flexible and dynamic way the best transport mode can be chosen. Nina Lemmens et al. developed a simulation model in order to analyse the possibilities of this new system by taking into account the inventory costs. With a numerical example they show how synchromodality can result in a modal shift to slower, but more environmentally friendly transport modes without compromising on costs or responsiveness. They warn that a prerequisite for synchromodal transport is the ability to freely choose which transport mode to use and to switch easily from one mode to another. Olaf Jonkeren et al. developed a shift-share based tool to assess the contribution of a modal shift to the decarbonization of the freight sector. Applicable to different distances and regional scopes, the tool provides policy makers with background information about the changes in CO2 emissions of a freight transport modal shift that occurred in the past, which in turn can be helpful in devising future transport policies. Manali Sheth et al. analyzed the possibilities of shifting cargo from delivery trucks to electric-assisted cargo bikes in the urban setting. Taking many factors into account, the papers shows in which situations a shift is suitable. Most important influencing factors are the proximity to the DC, number of stops distance between each stop, and number of parcels per stop. The future of transport will, according to these papers, certainly be sustainable. Achieving more sustainable logistics can be classified by the 4A’s as put forward by Macharis and Kin . In this Topical Collection certainly Awareness, Avoidance and Act and Shift were very prominently there. Almost all authors looked at the environmental impact of the new concepts. As researchers, we have indeed an important role in developing further methodologies to analyse, calculate and benchmark the societal impact of new concepts in order to make companies, authorities and citizens more aware. For the avoidance part, there are many ways to avoid unnecessary kilometers. Product compaction, packaging compaction but certainly also bundling of freight flows are major challenges for the future in the logistics sector. In this topical collection the avoidance of missed deliveries got quite some attention with the first two papers. Giving more information of the delivery times was analysed in the first one. Also in the second paper, the importance of timing of deliveries came out as an important conclusion. Thirdly, Act and Shift, is the idea to shift freight to more environmental friendly modes like rail, inland waterways and cargo bikes. Clearly a lot of research attention has to go there and is going there, as can be seen from the four contributions in this collection. The modal split has been staying for years at the same level and solution have to be found to create the modal shift. For cargo bikes, the potential is very high (half of the light products in a city can be transported by them), but also here we have to search further for good and viable operating models. The fourth A, Anticipation of new technologies, will of course also be an important aspect in the future of freight transport. What with autonomous vehicles, electric trucks, drones, and the like? This is an important topic for future research and upcoming NECTAR Cluster meetings. CM drafted the editorial. SN read, adjusted and approved it. SN followed the submissions for the special issue. Both authors read and approved the final manuscript. Ramaekers, K., Caris, A., Moons, S., & van Gils, T. Using an integrated order picking-vehicle routing problem to study the impact of delivery time windows in e-commerce. 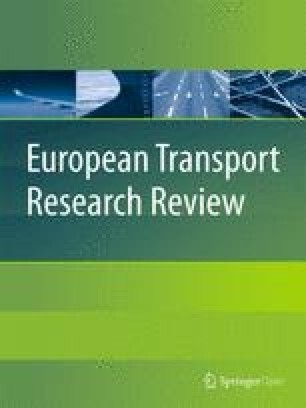 European Transport Research Review. https://doi.org/10.1186/s12544-018-0333-5. Gatta, V., Marcucci, E., Nigro, M., & Serafini, S. Sustainable urban freight transport adopting public transport-based crowdshipping for B2C deliveries. European Transport Research Review. https://doi.org/10.1186/s12544-019-0352-x. Nocera, S., Cavallaro, F., & Irranca Galati, O. Options for reducing external costs from freight transport along the Brenner corridor. European Transport Research Review. https://doi.org/10.1186/s12544-018-0323-7. Nina Lemmens, Joren Gijsbrechts, Robert Boute. Synchromodality in the Physical Internet: Dual Sourcing and Real-time Switching between Transport Modes. European Transport Research Review. https://doi.org/10.1186/s12544-019-0357-5. Jonkeren, O., Francke, J., & Visser, J. A shift-share based tool for assessing the contribution of a modal shift to the decarbonisation of inland freight transport. European Transport Research Review. https://doi.org/10.1186/s12544-019-0344-x. Sheth, M., Butrina, P., Goodchild, A., & McCormack, E. Measuring delivery route cost trade-offs between electric assist cargo bicycles and delivery trucks in dense urban areas. European Transport Research Review. https://doi.org/10.1186/s12544-019-0349-5. Macharis, C., & Kin, B. (2017). The 4 A’s of Sustainable City Distribution: Innovative Solutions and Challenges ahead. International Journal of Sustainable Transportation, 11(2), 59–71. https://doi.org/10.1080/15568318.2016.1196404.